The Aral Sea is situated in Central Asia, between the Southern part of Kazakhstan and Northern Uzbekistan. Up until the third quarter of the 20th century it was the world?s fourth largest saline lake, and contained 10grams of salt per liter. The two rivers that feed it are the Amu Darya and Syr Darya rivers, respectively reaching the Sea through the South and the North. The Soviet government decided in the 1960s to divert those rivers so that they could irrigate the desert region surrounding the Sea in order to favor agriculture rather than supply the Aral Sea basin. The reason why we decided to explore the implications up to today of this human alteration of the environment is precisely that certain characteristics of the region, from its geography to its population growth, account for dramatic consequences since the canals have been dug. Those consequences range from unexpected climate feedbacks to public health issues, affecting the lives of millions of people in and out of the region. By establishing a program to promote agriculture and especially that of cotton, Soviet government led by Khrouchtchev in the 1950s deliberately deprived the Aral Sea of its two main sources of water income, which almost immediately led to less water arriving to the sea. Not only was all this water being diverted into canals at the expense of the Aral Sea supply, but the majority of it was being soaked up by the desert and blatantly wasted (between 25% and 75% of it, depending on the time period). The water level in the Aral Sea started drastically decreasing from the 1960s onward. 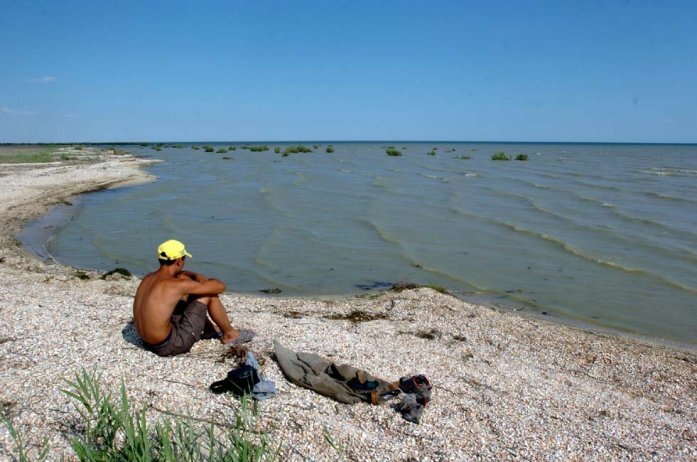 In normal conditions, the Aral Sea gets approximately one fifth of its water supply through rainfall, while the rest is delivered to it by the Amu Darya and Syr Darya rivers. Evaporation causes the water level to decrease by the same amount that flows into the Sea, making it sustainable as long as inflow is equal to evaporation on average. Therefore the diversion of rivers is at the origin of the imbalance that caused the sea to slowly desiccate over the last 4 decades. Where is the Aral sea? The Aral Sea is in central Asia, positioned across the border of Uzbekistan and Kazakhstan, just east of the Caspian Sea. The Aral Sea borders Kazakhstan and what other country. The Aral Sea borders Kazakhstan and Uzbekistan. Vozrozhdenie Island, in the middle of the sea, is both in Kazakhstan and Uzbekistan.